A triple-gold medal-winning Paralympian has criticised the government for cutting funding for many disabled people with high support needs. Sophie Christiansen expressed deep concern at the Conservative party’s manifesto pledge to make a further £12 billion in cuts to social security spending, but then refuse to say where those cuts would fall. In an interview with Disability News Service, less than 48 hours before the election polls open, Christiansen admitted she had felt uncomfortable witnessing other disabled people face cuts in their support while she and other well-funded British Paralympians were competing at London 2012. She said: “It was a bit of a juxtaposition, putting money into showing what disabled people could do in sport but then taking away funding that allowed disabled people to achieve other things. She said she was most angry with the coalition cuts that have been made to the essential “safety net” that many disabled people rely on. She particularly pointed to cuts in social care, the planned closure of the Independent Living Fund (ILF) and the introduction of the “bedroom tax”, as coalition policies that she felt were particularly unfair and had affected disabled people disproportionately. Although she is not an ILF-user herself, she does receive some social care support from her local authority, and knows how vital that is to many disabled people. She said: “I am actually employing someone to be my care worker, therefore reducing unemployment by one, and enabling me to work effectively. I am creating new jobs with that financial support. She added: “They have to cut somewhere but I do believe they are cutting from the most vulnerable people and it is just not fair on the disabled people who need that help to live a normal life. Christiansen, who won three equestrian gold medals at London 2012, said she wished that all governments would focus less on short-term policies, and more on long-term measures such as improving accessible transport and helping disabled people into work, which would eventually save the government money. And she said she feared for the futures of some of her younger Paralympian team-mates, who now receive generous funding that allows them to live in a comfortable “bubble”, protected from the barriers and discrimination and “difficulties of real life” faced by many other disabled people. She said: “Of course we work very hard, but the system is designed so that the structure and ‘work hours’ fit around what is best for our disabilities to get the best results. The real world of employment doesn’t function like that, yet. She also accepted that many disabled people were not huge supporters of the Paralympics. She said: “The Paralympics represented a small proportion of disabled people and that is why not a lot of them feel an affinity with the Paralympics. As well as training for the Rio 2016 Paralympics, the equestrian star is a data scientist intern for the investment banking giant Goldman Sachs, but needs a care worker to enable her to stay in London. 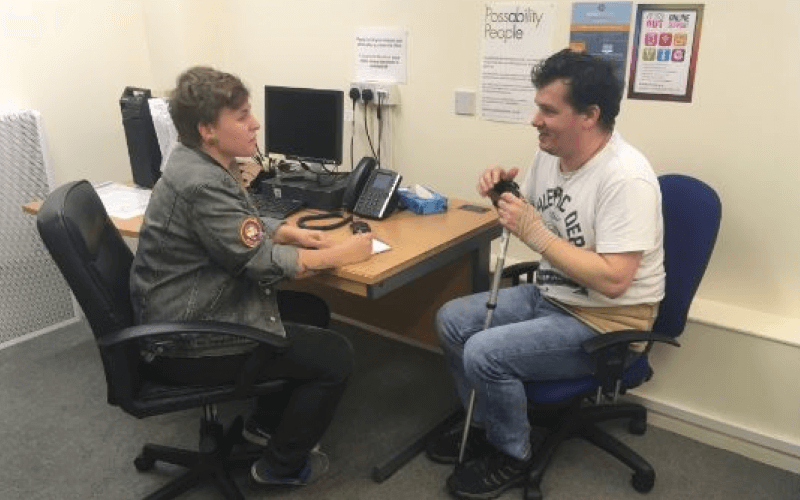 Christiansen believes that disabled people should have to show the government how they have used their disability benefits and other financial support. She said: “I think a lot of disabled people use their benefits for the good of society and we should highlight that, because I know a lot of them think they are seen as scroungers. She also said she would have liked the government to have done far more to illustrate how many disabled people had volunteered at London 2012, which she said had “really showed the world what disabled people can do”. Despite her anger and frustration at some of the government cuts, she has just returned from a week in Rwanda with charity Chance for Childhood (pictured), a trip that underlined to her that disabled people were comparatively better off in the UK than in many other countries. And she was also critical of many people in the UK who she said had a “sense of entitlement” to benefits if they do not or cannot work. Despite her strong criticisms of the government, she has not expressed support for any party, although she said she knows who she will vote for tomorrow (Thursday). And she is convinced that none of the parties have explained clearly enough what they would do for disabled people. She is also loath to trust any of the parties to keep to their word once they are elected.